The holidays are such a wonderful time to enjoy your furry family members. But there are several things that can turn enjoyment into less than fun, so take a moment to ensure that you are providing a safe and healthy holiday for your friends. If you have a Christmas tree, please make sure that you anchor it well, also block off the water for the tree to decrease ingestion as it can cause a range of gastrointestinal issues for your pet. Holly, mistletoe, poinsettia along with pine needles can all cause GI distress to your pets and should be kept out of reach and monitored. 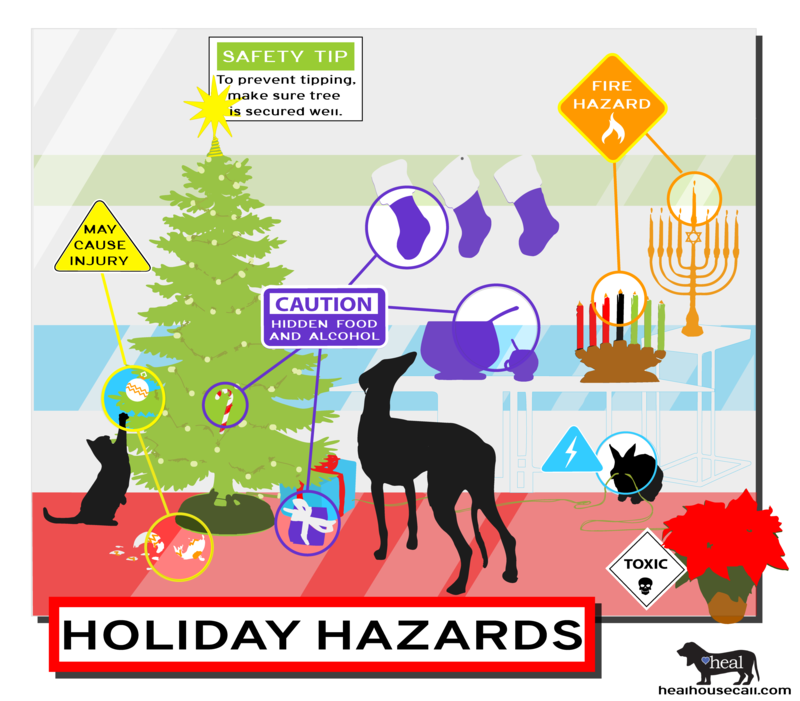 If decorations include tinsel/ornaments/bows/yarn/hooks, etc., do your best to keep access from cats and dogs– all can result in foreign bodies, traumatic injury and can be a danger to your pets. Make sure that smoke detectors are in good working condition. Ensure that there are never unattended lit candles, dry tree branches or lights that can be a fire hazard! Wires and lights are enormously attractive to cats, dogs and all sorts of chewers (think guinea pigs and bunnies!) Keep out of reach and watch for shocks, exposed wires and outlets. Keep in mind that wrapped gifts under the tree may contain chocolate, food, liquor, etc. Keep pets’ access when unattended at a minimum. Foods and sweets on the table, in the kitchen, in stockings, on the tree, in lovely decorative holiday bowls–all need to be kept away from prying eyes and noses! The same goes for leftovers. Minimize any fatty, sweet, bone-filled foods that you have the urge to feed to your pets. Alcoholic drinks can cause liver and other damage to your pets. Make sure drinks are being watched closely during parties or when sitting on living room tables. 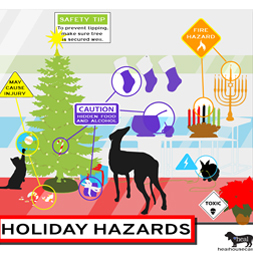 Of course, pets are a part of the celebration, but ensure that treats and gifts for your pets are monitored when being ingested (and don’t think they won’t investigate under the tree if a gift smells particularly appealing to them). Make sure guests are also aware of your pet’s habits. Watch the door, new bags to explore, medications and foods should be kept under lock and key! Happy Holidays from Heal House Call Veterinarian! !